There are total 1704 vacancies available through National Rural Livelihoods Mission in State/District & Block level. Candidates applying to the State Level Position must not exceed the upper age of 55 Years and for District/Block level position, applicant’s maximum age must not be above 40 years as reckoned on 12-08-2018. 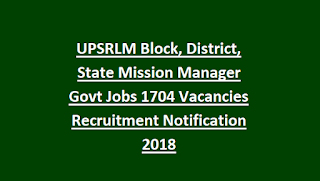 Candidates interested to work under UPSRLM must be a Post-Graduate in the concerned discipline with minimum 7 years of work-experience in the relevant sector for State Level Posts, 3 years for District and 2 years for Block level Posts. Applicants who have successfully registered for the NRHM Jobs will be assessed on the basis of Academic Qualifications/Skill Test followed by Document Verification. Candidates interested can apply online through the official website http://www.srlm.up.nic.in/ before the due date i.e. 31st August 2018. 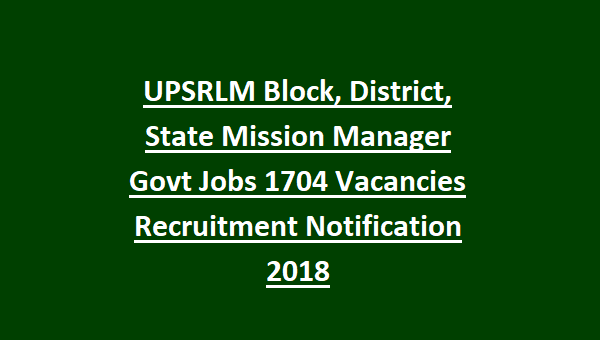 Candidates seeking possession under UPSRLM Block, District, State Mission Manager Jobs Recruitment 2018 can refer the official notification.